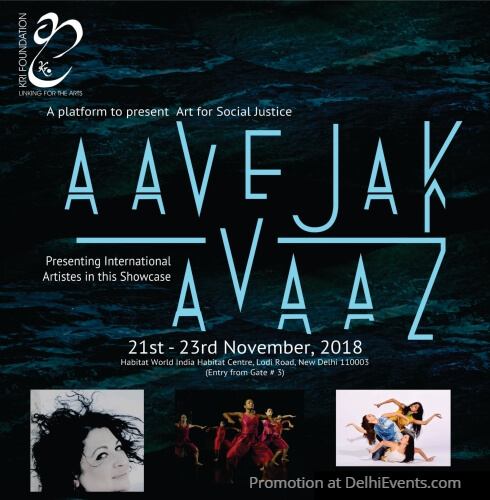 'Aavejak Avaaz' is an urgent, two language title with the first word coming from Hindi and the second from Urdu- to reflect the syncretic society that India has been and to remind right thinking citizens of India how immediate action is needed if we have to stall its fragmentation, an unhappy fact which we hear of and see before our eyes and in social media, every day. We believe that the arts have the power to make a compelling argument. The call to catalyze, is a deliberate choice as we wish to use the arts not just for activism ( ‘Arts for Activism’ has been our past mantra) but for Social justice, the righting of historical wrongs against communities, based on a more permanent social and attitudinal change a change that India needs urgently. We also recognize that this change can come only through collaborative efforts and we can each strengthen resolve and efforts by sharing our stories of struggle and success. Talk: Syrian Curator Alma Salem, speaks on“ Aesthetic is an Essential Human Right”. After the personal trauma of war and relocation, she has once again revived her artistic connections in the region and over-imaginative platforms, including “Syria Sixth Space”. Her efforts have brought together the community of artists to tell of the tribulations that they encounter and the resistance that they offer. She has just set up the Freedom Museum as well. In her presentation, she uses dance films and visual artworks to stir the conscience of the world to the tragedy of her land. “In Our Bodies Live Our Stories” ( 60 mins). The preview of this ‘documentary film in the making’ captures excerpts from Ananya Dance Theatre’s visually striking performances over many years, against candid conversations that illuminate their journey and philosophy. It embodies the joy, struggle and resilience of women from global communities of color, articulating social justice through a distinctive language of Contemporary Indian Dance. Present for the Q & A will be Darren Johnson, Director and Filmmaker and the dancers of the Ananya Dance Theatre. Ananya Dance Theatre’s 'Shaataranga: Women Weaving Worlds’ (70 mins with no intermission).